When the Porcelain Doll seeds are purchased, growers agree to donate 25 cents per pumpkin to the foundation. In just two years, the foundation has raised over $100,000, one pink pumpkin at a time. Jacob Froese said the development of the pink pumpkin variety known as Porcelain Doll was serendipitous. Created unintentionally, the Froese family, Cheraw, Colo., worked backward to segregate the original pink pumpkin and develop seeds for distribution. Colorado Seeds, the Froese's seed breeding company, distributes Porcelain Doll seeds, as well as multiple other varieties, directly to seed companies. With the advent of the pink pumpkin, another connection was created. Carol Holsopple-Froese, who owns the company alongside her husband, David, is a breast cancer survivor. Out of her fight and victory, the family created the Pink Pumpkin Patch Foundation to benefit breast cancer research, with Carol as president. When the Porcelain Doll seeds are purchased, growers agree to donate 25 cents per pumpkin to the foundation. In just two years, the foundation has raised over $100,000, one pink pumpkin at a time. The Froese family has also partnered with FFA chapters all across the country, and most recently the newly minted Cheraw FFA Chapter. 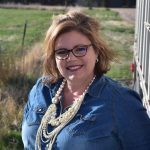 Colorado Seeds donates the seeds for the chapter to use and the funds from pink pumpkin sales are split between the participating FFA chapter and the foundation. 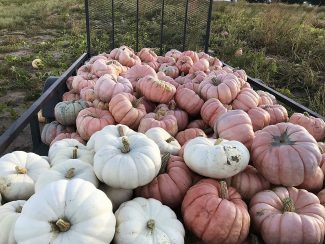 Jacob Froese's wife, Kerry, also works with Women Involved in Farm Economics and has created a similar program to benefit both WIFE and the Pink Pumpkin Patch Foundation. Most recently, Kerry's mother, Kimmi Lewis, Kim, Colo., battled breast cancer and is now in remission, adding another connection to the pink pumpkins.